The goal of the High Availability architecture in Azure SQL Database is to guarantee that your database is up and running 99.99% of time, without worrying about the impact of maintenance operations and outages. Azure automatically handles critical servicing tasks, such as patching, backups, Windows and SQL upgrades, as well as unplanned events such as underlying hardware, software or network failures. When the underlying SQL instance is patched or fails over, the downtime is not noticeable if you employ retry logic in your app. Azure SQL Database can quickly recover even in the most critical circumstances ensuring that your data is always available. The high availability solution is designed to ensure that committed data is never lost due to failures, that maintenance operations do not affect your workload, and that the database will not be a single point of failure in your software architecture. There are no maintenance windows or downtimes that should require you to stop the workload while the database is upgraded or maintained. Standard availability model that is based on a separation of compute and storage. It relies on high availability and reliability of the remote storage tier. This architecture targets budget-oriented business applications that can tolerate some performance degradation during maintenance activities. Premium availability model that is based on a cluster of database engine processes. It relies on the fact that there is always a quorum of available database engine nodes. This architecture targets mission critical applications with high IO performance, high transaction rate and guarantees minimal performance impact to your workload during maintenance activities. Azure SQL Database runs on the latest stable version of SQL Server Database Engine and Windows OS, and most users would not notice that upgrades are performed continuously. These service tiers leverage the standard availability architecture. The following figure shows four different nodes with the separated compute and storage layers. A stateless compute layer that runs the sqlserver.exe process and contains only transient and cached data on the attached SSD, such as TempDB, model database, plan cache, buffer pool and column store pool. This stateless node is operated by Azure Service Fabric that initializes sqlserver.exe, controls health of the node, and performs failover to another node if necessary. A stateful data layer with the database files (.mdf/.ldf) that are stored in Azure Blob storage. 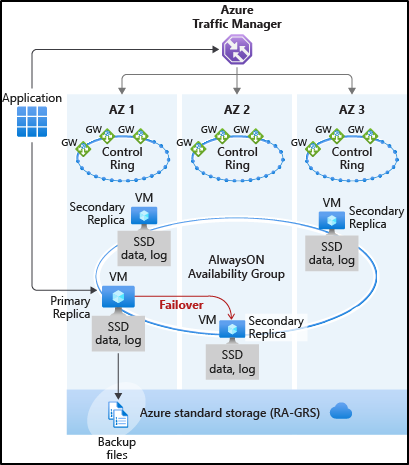 Azure blob storage has built-in data availability and redundancy feature. It guarantees that every record in the log file or page in the data file will be preserved even if SQL Server process crashes. Whenever the database engine or the operating system is upgraded, or a failure is detected, Azure Service Fabric will move the stateless SQL Server process to another stateless compute node with sufficient free capacity. Data in Azure Blob storage is not affected by the move, and the data/log files are attached to the newly initialized SQL Server process. This process guarantees 99.99% availability, but a heavy workload may experience some performance degradation during the transition since the new SQL Server instance starts with cold cache. Premium and Business Critical service tiers leverage the Premium availability model, which integrates compute resources (SQL Server Database Engine process) and storage (locally attached SSD) on a single node. High availability is achieved by replicating both compute and storage to additional nodes creating a three to four-node cluster. The underlying database files (.mdf/.ldf) are placed on the attached SSD storage to provide very low latency IO to your workload. High availability is implemented using a technology similar to SQL Server Always On Availability Groups. The cluster includes a single primary replica (SQL Server process) that is accessible for read-write customer workloads, and up to three secondary replicas (compute and storage) containing copies of data. The primary node constantly pushes changes to the secondary nodes in order and ensures that the data is synchronized to at least one secondary replica before committing each transaction. This process guarantees that if the primary node crashes for any reason, there is always a fully synchronized node to fail over to. The failover is initiated by the Azure Service Fabric. Once the secondary replica becomes the new primary node, another secondary replica is created to ensure the cluster has enough nodes (quorum set). Once failover is complete, SQL connections are automatically redirected to the new primary node. As an extra benefit, the premium availability model includes the ability to redirect read-only SQL connections to one of the secondary replicas. This feature is called Read Scale-Out. It provides 100% additional compute capacity at no extra charge to off-load read-only operations, such as analytical workloads, from the primary replica. By default, the cluster of nodes for the premium availability model is created in the same datacenter. With the introduction of Azure Availability Zones, SQL Database can place different replicas in the cluster to different availability zones in the same region. To eliminate a single point of failure, the control ring is also duplicated across multiple zones as three gateway rings (GW). The routing to a specific gateway ring is controlled by Azure Traffic Manager (ATM). Because the zone redundant configuration in the Premium or Business Critical service tiers does not create additional database redundancy, you can enable it at no extra cost. By selecting a zone redundant configuration, you can make your Premium or Business Critical databases resilient to a much larger set of failures, including catastrophic datacenter outages, without any changes to the application logic. You can also convert any existing Premium or Business Critical databases or pools to the zone redundant configuration. Because the zone redundant databases have replicas in different datacenters with some distance between them, the increased network latency may increase the commit time and thus impact the performance of some OLTP workloads. You can always return to the single-zone configuration by disabling the zone redundancy setting. This process is an online operation similar to the regular service tier upgrade. At the end of the process, the database or pool is migrated from a zone redundant ring to a single zone ring or vice versa. Zone redundant databases and elastic pools are currently only supported in the Premium and Business Critical service tiers. By default, backups and audit records are stored in RA-GRS storage and therefore may not be automatically available in case of a zone-wide outage. Accelerated Database Recovery (ADR) is a new SQL database engine feature that greatly improves database availability, especially in the presence of long running transactions. ADR is currently available for single databases, elastic pools, and Azure SQL Data Warehouse. Azure SQL Database features a built-in high availability solution, that is deeply integrated with the Azure platform. 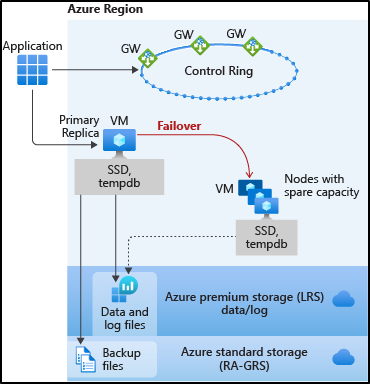 It is dependent on Service Fabric for failure detection and recovery, on Azure Blob storage for data protection, and on Availability Zones for higher fault tolerance. 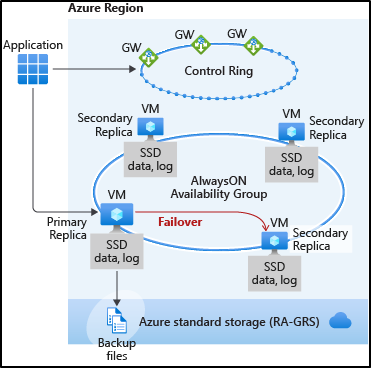 In addition, Azure SQL database leverages the Always On Availability Group technology from SQL Server for replication and failover. The combination of these technologies enables applications to fully realize the benefits of a mixed storage model and support the most demanding SLAs.